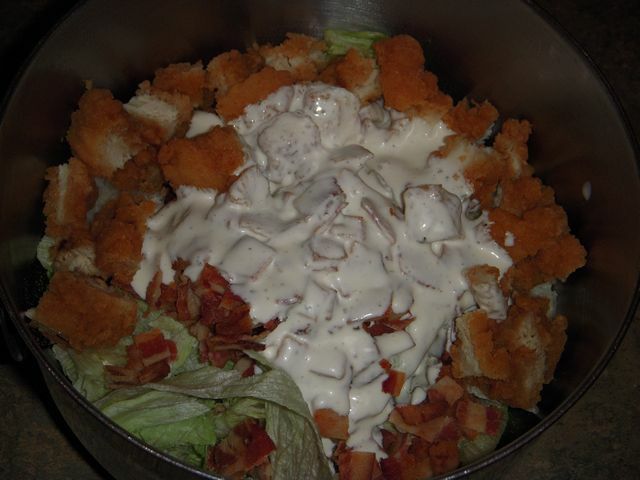 I don’t understand what people see in the mayo version of chicken salad; you know what I’m talking about, crap like this! Something about “normal” chicken salad just makes me wonder. It doesn’t even look appetizing to me, just a big white pile of mush. Kind of like American style potato salad, which doesn’t hold a candle to warm German style potato salad. But that is a story for another time. 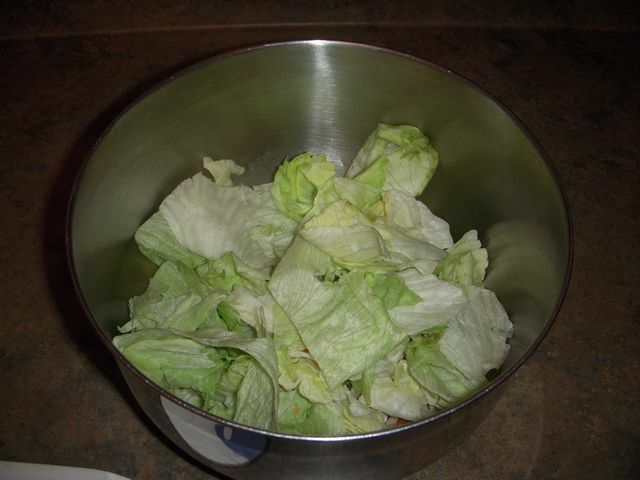 Personally I’m not a big salad fan to begin with, due to a couple of bad personal experiences. But I haven’t written off salad completely, it just makes me pickier about the salads that I do eat. So once again I’m pulling out a recipe from my time in Germany, which was inspired by my moms taco salad recipe. 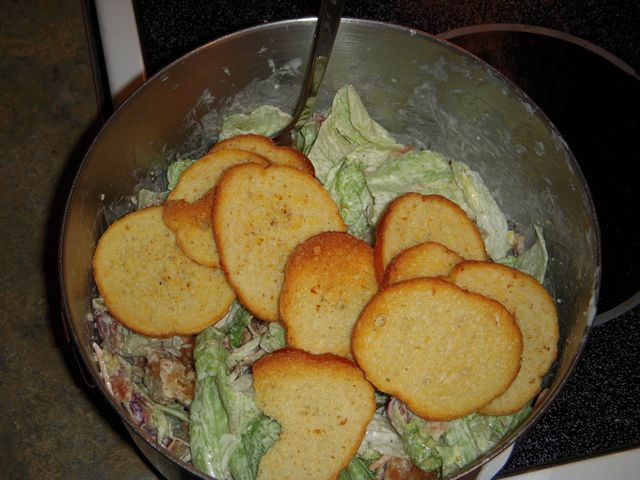 When I was a kid I always thought that her taco salad seemed so complex, but it is very simple to make…. also a story for another time. 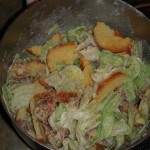 When I normally think of “chicken salad” I think of a mixed lettuce salad with chicken mixed in. And not cubed chicken mixed with mayo and god only knows what else. So it is long overdue to reboot the chicken salad from scratch, and actually add some salad to the chicken salad, since it does make up half of the phrase. Before I knew what the American version of chicken salad was, since my mom never made it while I was a kid. 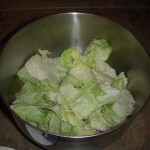 I always though that it was basically a lettuce salad with chicken mixed in, which would make sense if you had never seen the white pile of mush version. 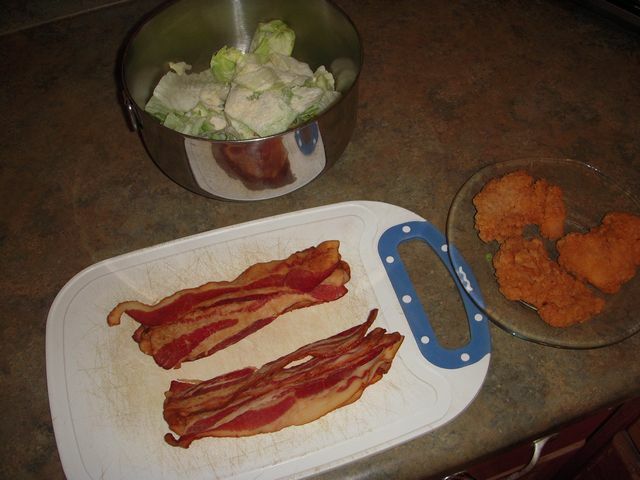 So here are the ingredients that I’ve come up with for my version of a chicken salad. 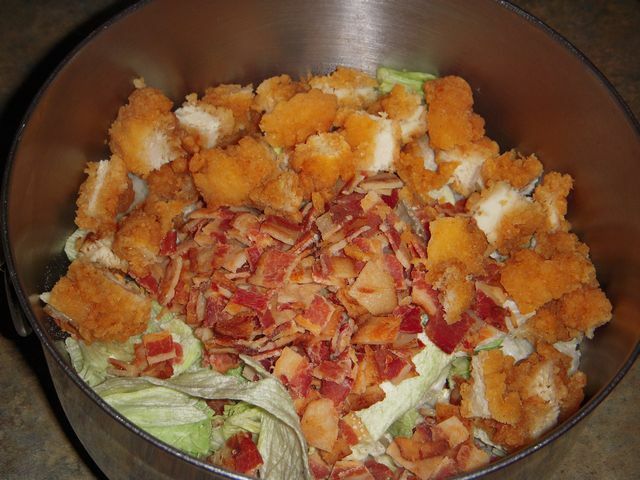 This salad may not be for the health conscious types out there. But for the ones that actually like to have their food taste like something other then bland, this may be for you. Also if you ever tell people you are going to just have a salad for dinner, you’ll have the real story. You’re probably looking at this recipe and saying, “What the hell, this isn’t a recipe, but more like an outline?”, and that’s the whole point. I could have listed the exact measurements for each and every item, but that really isn’t how to make it, since a lot of this salad is about the visual look of how the items are distributed. So you almost have to make it by eye, due to all the irregular items that are being combined. Cooking by eye, is at the bottom of my preferred methods of cooking, but I’ve tried at add a couple of measurements just the get the ball rolling. 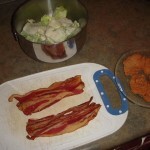 If anything I would advise that if you are going to make this chicken salad, start with all the minimums for each item. 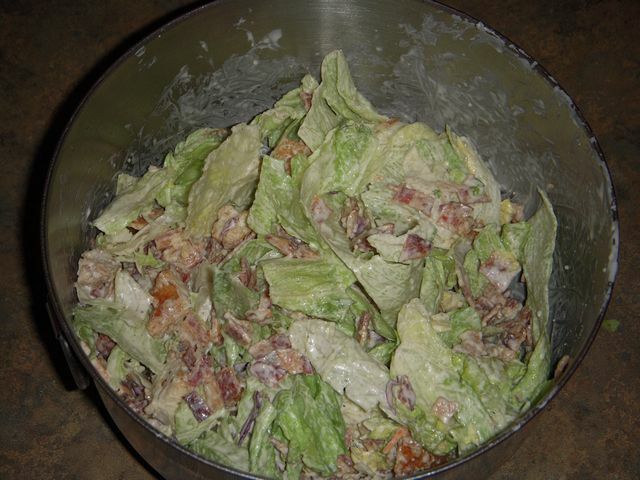 Then after you’ve mixed everything up, you can visually assess the salad to see what more you need to add. “Well this salad needs a little bit more dressing and more french fried onions.”, and kind of go from there until it looks right for you. Enjoy! 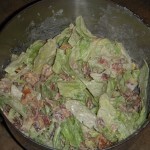 1) Don’t use a romaine mix, it tastes very strange with ranch dressing. 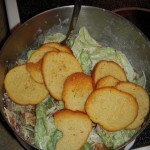 2) I think that store bought croutons are the biggest rip-off in the world. The bagel chip idea just kind of came out of nowhere. It probably helps that I buy bagel chips by the big bag at Sam’s Club, so I’ve also got them on hand. 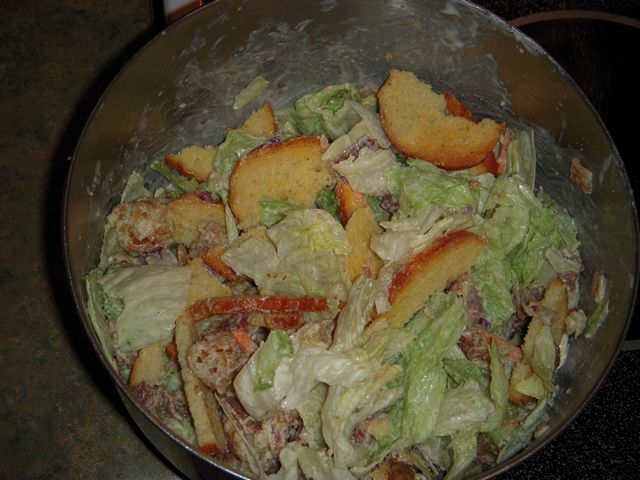 Plus it was a very cost effective and more flavorful substitution for croutons in my opinion, since you don’t have to scrimp on the crunch factor. 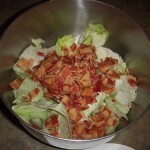 3) If you happen to add to much dressing, it can be solved one of two ways: more salad or more bagel chips. The best part about going the bagel chip route, is that since the bagel chips are bone dry to begin with they will absorb up any excess dressing. So add them at the very end of the mixing to fix any mistakes. 4) You can easily turn this from a chicken salad into a taco salad by swapping out the chicken fingers for cooked taco meat, and changing the bagel chips for regular Doritos’s. You can also add some canned green chilies, for a little bit of spice/heat. 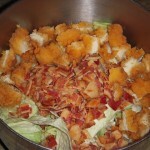 5) Heat up the chicken fingers in the microwave before mixing, also adds a nice little touch to the salad. 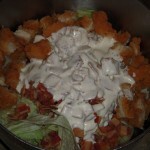 6) Want to make it a buffalo chicken salad, just add a little frank’s red hot to the chicken fingers. 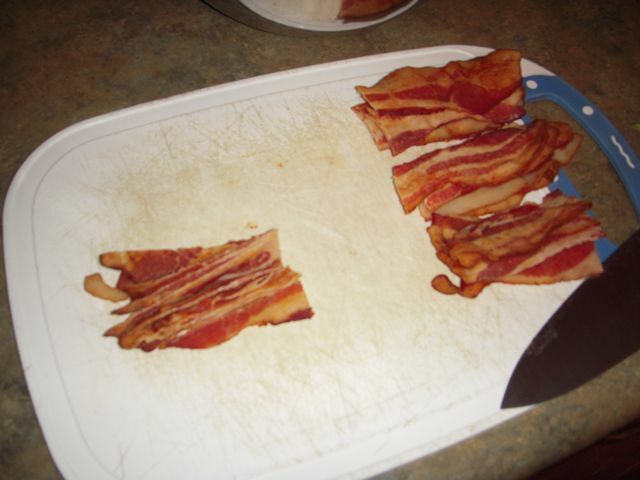 Let them soak it in for a couple of minutes, then cut them up and toss in the salad. Well I guess that I’m already a little bit ahead of the game. I do make my own buttermilk ranch dressing; 1 hidden valley ranch packet, 1 cup regular buttermilk, 1 cup Hellmann’s Mayo……and I shake it all up in my Hidden Valley Ranch shaker from when I was a kid. That is one item I never understood why people would buy since it’s easy to make at home. Plus buttermilk lasts way past the expiration date, so I always have a carton in the fridge. 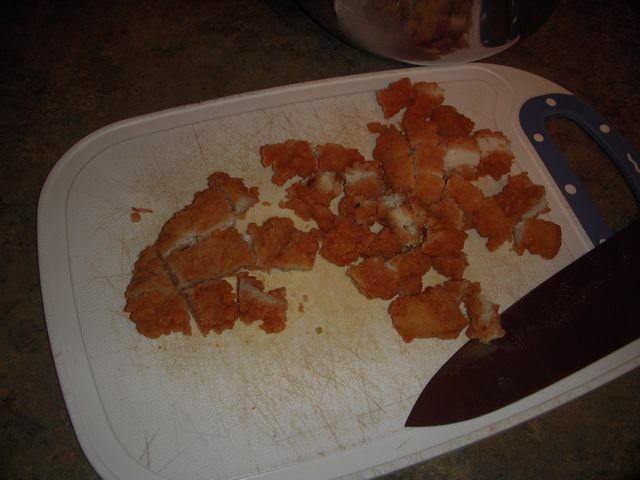 And I also make my chicken fingers from scratch; I usually cut up a chicken breast into 3-4 tenders, coat in AP flour, an egg wash then plain breadcrumbs (I also make my bread crumbs from plain white bread dried in the oven, then put through a food mill.) I do fry the tenders for a couple of minutes on each side, but then I finish the cooking in the oven for about 10 mins at 350F. But when I do make chicken tenders (about once a month) I do make up about a whole jelly roll pans worth (3-4 whole breast fillets). Since if I’m going to make a mess, I might as well make a big mess. It’s funny because on my sandwiches I always use romaine and never iceberg. But for salads it’s the other way around. I’ll have to give the spinach addition a try, since I already like spinach, so it should be an easy addition. First place is the ranch dressing. I am going to guess that you are using a store bought version (probably Marzetti’s or something similar). Make your own at home, little buttermilk, little 1% yogurt, tiny bit of 1/2 fat Mayo. Mix it with whatever ranch mix you can get (Hidden Valley, Penzey’s, etc.) and you have a delicious (and probably creamier/less acidic) dressing. Second spot is the chicken fingers. I would guess that you are using a frozen bag of pre-made fingers from Costco, or similar. 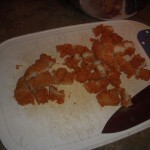 find a good recipe for “oven fried” chicken and use that instead, cooks has an excellent one. 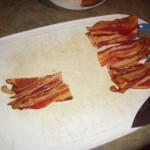 You can make a big batch on a weekend and just food save them for when they are needed. It’s a little more work on the front end, but it should both taste better and save you a ton of fat and calories without losing much flavor. I’d also sub in at least half spinach in the greens dept, it can stand up to ranch, especially the non-baby type. Now I’m curious, where would you start to cut the fat, or change the fat? I saw the disclaimer in the beginning. I am saying you could have almost the exact same salad, probably cut the fat down by half and barely notice the difference. My sis was just commenting about how I should have used romaine or mixed greens. But when I think of mixed greens, I think of using a vinaigrette instead of ranch. 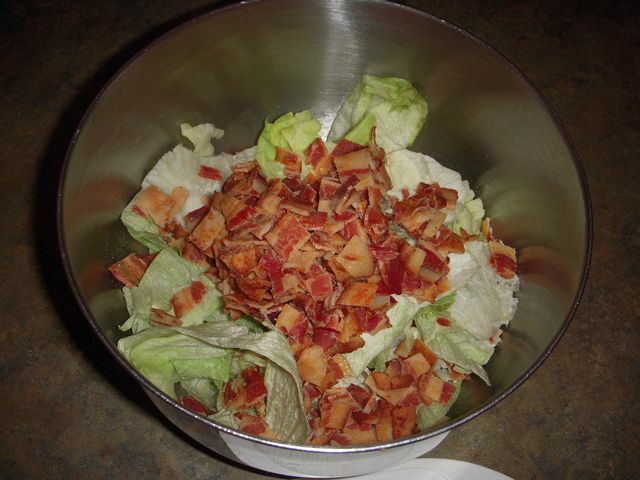 Hence the notice in the first half of the post about this not being a healthy salad……This is more like the salad at Orlondo’s, which is a trucker salad.